It's been a buzzy February. I started out the month speaking about Social Media at the ANLA Management Clinic in Louisville. If you are on the fence about having a Facebook Fan page or Tweeting, take a look at the presentation "Social Media: Do I do or do I don't?". 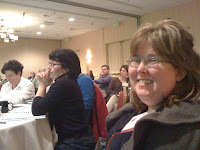 After ANLA, I flew to Boston to present the Garden Media Group's 2010 Trends Report at New England Grows. It's a huge show. 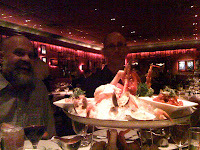 The night I arrived, I went to a Tweetup of garden writers and landscape designers. It was fun to put names to faces. And last week was another whirlwind. 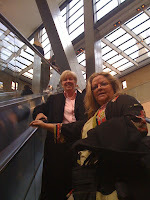 I spent a fabulous three days in New York visiting media with Margie Grace, APLD 2009 International Landscape Designer of the Year. We're pictured here with the publishing group from Tauton Press, going up to visit editors at the Hearst Building and at dinner with the folks from Martha Stewart Living. 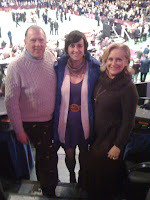 Margie's partner, Dawn Close, took us all to the finals of the Westminster Dog Show! It was fabulous. That's Fred and Katie with me looking out on the show ring. I got home, change suit cases and flew to Berkely CA for the Association of Professional Landscaper's strategic planning meeting and annual APLD Chapter Leadership Symposium. About 70 landscape designers from around the country gathered to share and learn how to grow a stronger organization. The new APLD tag line: We define landscape design. 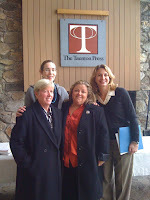 I presented something on branding and Susan Cohan talked about social media as we all tweeted. That's Kathy Rudnyk from Monrovia, one of the sponsors of the event. This week is The Philadelphia Flower Show and two TV gardening segments on NBC 10, so look for more on that later.